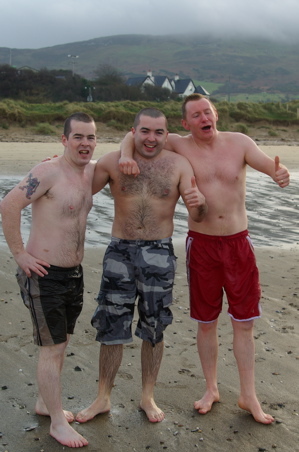 It take dedication to decide that the best thing to do on a Christmas morning is …… to throw yourself willingly into Lough Swilly, Co. Donegal! But that is exactly what some 100 men, women, boys and girls decided to do to-day! In temperatures just above freezing they swarmed across the beach through a bitingly cold breeze towards almost certain hypothermia in the sub-zero waters…..
And they basically flung them selves into the sea all and all in the name of charity! Surprisingly all survived to tell the tale, some even managing wide grins through chattering teeth! And among the charities that will benefit is the Foyle Hospice in Derry where fund raisers will be more than glad to accept any late donations to aid their splendid work with cancer patients in the Derry and Donegal! 10001 Santas…. 13000 Turn up! Well done… well done well done! Congratulations to all the Santas who stood on the Derry walls in absolutely terrible weather to achieve the World record! The good old beeb has the full story here.. but only Martin Mullan and the other organisers know what it has taken to achieve this Guinness World Record.